Since he first started surfing the swells at Mavericks in 1993, Zach Wormhoudt has ridden his fair share of mean waves. But charging 50-foot behemoths may pale in comparison to his latest idea — building a full-scale replica of a Mavericks wave to foster ocean awareness. In a social media post last month, Wormhoudt, a surfer and landscape architect, floated his vision of the bold public art exhibit. 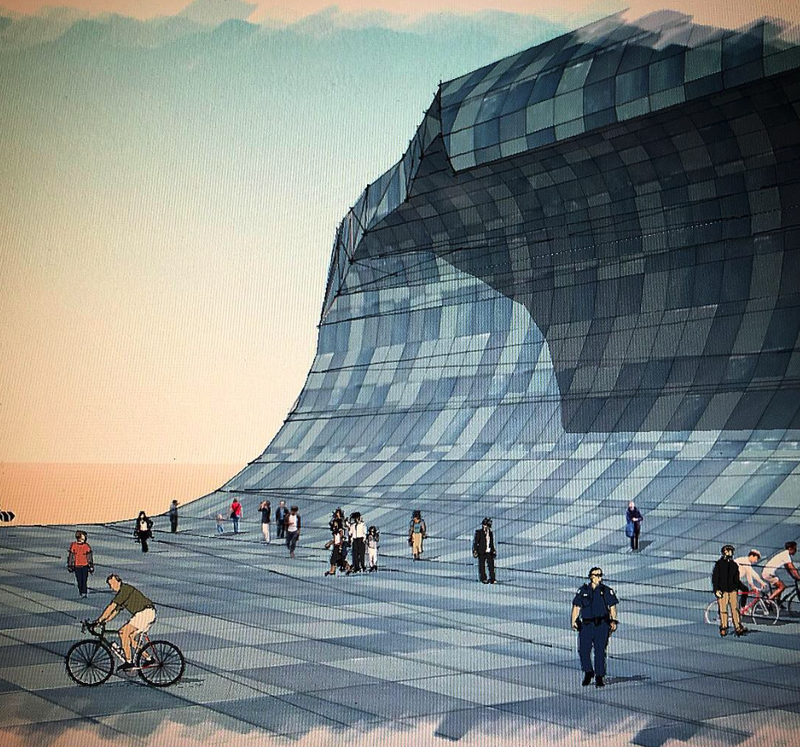 He also posted several preliminary concept sketches, showing pint-sized people milling about an aquamarine sculpture, the lip of a towering wave curling overhead. “Picture the largest wave from the largest swell in the last century, frozen and transported to (the bluffs) above the Half Moon Bay Airport,” wrote Wormhoudt on Instagram. He said that the interactive sculpture would provide visitors with a glimmer of what it’s like to tackle the tubes at the famed surf break. As recently as last December, the waves at Mavericks soared to contest levels. Wormhoudt is no stranger to thinking big. A third-generation landscape architect, he’s spent more than 20 years designing public skate parks, including some of the largest and most conceptually ambitious in the world. As the principle architect for California Skateparks, he’s worked on more than 200 municipal skate parks, such as Lake Cunningham Regional Skate Park in San Jose. At 68,000 square feet, it is the largest skate park in California. Based in Santa Cruz, Wormhoudt nevertheless holds a deep affinity for the Coastside. In addition to surfing Mavericks for decades, he often spends time in El Granada. He said he first came up with the concept by observing the rock formations on the bluffs overlooking Mavericks. He thought they looked like waves — or perhaps the contours of a skater’s half-pipe. Wormhoudt said he was also inspired to promote awareness of ocean conservation issues, such as climate change and plastic pollution. “A lot of surfers have positions about protecting the ocean,” he said. “And it just comes from their interactivity with the ocean. For someone who’s visiting from Iowa, they may have never given it much thought. But if they want to go check out this landmark wave spot, now they have a connection. The materials used in constructing the wave itself, from recycled fishing gear to waterproof textiles, might tell their own stories. While his initial post said the sculpture would be composed of concrete panels, Wormhoudt clarified that those would likely be used to build the substructure beneath the surface. “If you had driftwood on top of a substructure, doing what it needs to do, structurally, you would get a different response from the general public,” he added. The challenges of achieving his vision on the Coastside are not lost on Wormhoudt. For now, Wormhoudt is focusing on concept design and engineering, in addition to securing the project’s financing. Since his March 24 Instagram post, he’s been flooded with calls from people eager to execute his vision. But despite proposals to build the sculpture in Nevada, New Mexico and even Chile and Portugal, Wormhoudt is taking it one step at a time. "Wormhoudt nevertheless holds a deep affinity for the Coastside" -- and yet he somehow thinks this monstrosity makes sense for the Coastside or that Coastside residents will be happy to see a five story structure on coastal lands that provides no public benefit? The idea that we can "promote ocean conservation" by erecting ugly, needless structures on the coastline is absolutely farcical and is reminiscent of many other greenwashed projects which get proposed time and time again for the coastline and bayshore in San Mateo County. Wormhoudt should take this nifty idea and just go away. Maybe someplace on Interstate 90 in South Dakota. Shtick like Wall Drug, the Corn Palace, Bear Country USA, Cosmos Mystery Area, and the Reptile Gardens does well there. The attempts to monetize Mavericks have done enough damage. Please, not here.